Globe is located in the heart of Arizona's magnificent Tonto National Forest and is surrounded by some of the most spectacular mountain vistas in the Southwest. It has a colorful history, punctuated by mining discoveries and is supposedly named for a globe-shaped piece of pure silver found nearby. The mining and ranching economic base is still a major factor in the city's economy. Globe is situated near the mid-point of the legendary Old West Highway that stretches from Apache Junction, Arizona east to Lordsburg, New Mexico. Globe is also the eastern terminus of the Apache Trail, which runs northwest to Theodore Roosevelt Recreation Area, then turns southwest too Apache Junction. Since the times of the Spanish conquistadors, it was known that mineral deposits could be found in and around the Pinal Mountains. When mountain men explored the area in the 1820s and '30s, they also recognized the mineral wealth located there, but Apaches were far too numerous to do serious prospecting. Parties led by Corydon E. Cooley and Calvin Jackson were the first white man to extensively explore the mineral wealth of the region. Jackson continued to prospect in the Pinal Mountains and was joined by a former member of Cooley's expedition, William A. "Hunkydory" Holmes. When these prospectors began to be harassed by Apaches, they constructed a rough fort in late October 1869 at Big Johnny Gulch, 2 miles north of what would later become Globe. They never found gold, but they did discover silver, and in November 1870, 15 claims were staked at what was to become one of the richest mineral districts in the US. In 1871 they organized themselves into the Pinal Mining Company, at a place they called "Cottonwood Springs, Arizona Territory." Soon other prospectors also began making claims throughout the region. The San Carlos Apaches continued to resist these incursions into their territory, which resulted in the Camp Grant Massacre in 1871. By the spring of 1873, General George Crook's Tonto campaigns had terminated nearly all San Carlos Apache raiding parties. David and Robert Anderson of Florence led still another prospecting expedition into the Pinal Mountains in September 1873 and became the first to file the "Globe Ledge" claims. In late October, Tucson citizens submitted a petition asking the US Secretary of Interior to remove this mineral region from the already-established San Carlos Apache Reservation. The region was shortly severed from the reservation and restored to public lands called the Globe Mining District. The Mining Act of 1872 was adopted as the law governing the district. When silver was soon found in many places -- the Globe Ledge (then called Andrew Hammond's Camp), Richmond Basin, the Stonewall Jackson, Pioneer, Ramboz Camp -- prospectors and miners poured into the area. The town site of Globe City was laid out in July 1876, officials were elected, and retail stores began to appear. In 1877, with reduction works established at Miami Wash, mining became mechanized and profitable. By 1887, a stage line began operating between Globe and Silver City, New Mexico, and on May 2, 1878, the first issue of the Arizona Silver Belt, Globe's newspaper, still in operation, was published. 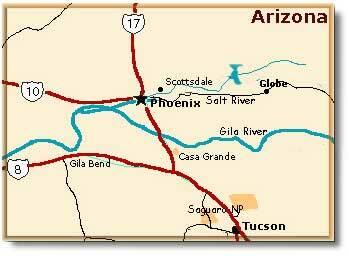 In February 1881 Globe became the seat of a new Arizona county -- Gila County. As silver began glutting the market, Globe turned to copper mining, which became the area's most profitable enterprise and continues to this day. The Globe area ceased silver mining altogether by 1890. Although the region changed enormously in the 1880s, Globe remained a frontier town. Isolated from "civilization" by more than 100 miles, and adjacent to the San Carlos Apache reservation, colorful, historic events continued in the area including stage robberies, killings, mining disputes and lynchings. In July 1882 a rebel Apache, Natiotish, broke out of San Carlos and headed north with a band of 50, attacking ranches and mining camps along the way until eventually subdued. Both Geronimo and the Apache Kid were local legends, and the kid's final trial was held in Globe on 23 October 1889. In 1884 the surviving Clanton brothers Ike and Phineas arrived in Apache County after the fight the infamous gunfight at the OK Corral in Tombstone. Ike was eventually killed by a local deputy sheriff, and Phineas, after serving prison time for a stage robbery, moved to Globe, where he died of pneumonia and was buried in 1906. Enjoy strolling through this historic town, where colorful history lurks on every corner. Driving the Apache Trail is another good way to spend the day. April: Copper Dust Stampede Days - includes parade, dancing and barbecue. October: Apache Days - On the third Saturday in October, the Apache "Jii" Celebration transforms downtown Globe into a street full of spectacular works of art and Native American cuisine. Includes Native American arts, crafts, clothing and food. There are hotels and motels in Globe with something for every taste and price range. For more information and a complete list, click here for rates, availability and reservations online. Superior, Arizona: 25 miles west. Apache junction, Arizona: 51 miles west. Phoenix, Arizona: 89 miles west. Oracle, Arizona: 68 miles south. Tucson, Arizona: 107 miles south. Tonto National Monument: 30 miles north. Casa Grande Ruins National Monument: 60 miles southwest. Lost Dutchman State Park: 55 miles west. Catalina State Park: 90 miles south. Theodore Roosevelt Lake Recreation Area: 30 miles north. Devil's Canyon: 35 miles north. Boyce Thompson Arboretum: 20 miles west. Besh-Be-Gowah Archeological Park: 2 miles south.